Before I begin rambling on about this week's lunch menu, I wanted to take a minute to answer a question that I've been receiving over and over since I began the Ethan's Weekly Eats feature: How? How do I find the time and energy to put together these sometimes elaborate meals while an energetic toddler tears through the house like a tornado? Good question. The truth is, most of the recipes I prepare for Ethan's lunch are simple and don't take more than a few minutes of hands-on prep work. If it does take a while, chances are it spends most of it's time baking in the oven in which case I am reading Ethan a story or playing with him in the living room. (I should also note that I meal plan all of Ethan's lunch recipes at least a week out, too! There's no way I could think of anything on the spot.) During my time of assembling and preparing lunch, however short a time it is, I try to occupy Ethan's attention with whatever toddler safe "toys" I can find in the kitchen: a soup pot, three old baby bottles, a wooden spoon and some plastic measuring cups take me a long way. Ethan can spend ten minutes taking the items out of the pot, placing them back in the pot, stirring them, throwing them over the baby gate, trying to retrieve them back with the wooden spoon through the slats in the baby gate, drumming on the pot with the wooden spoon, clapping the measuring cups against one another -- by the time he gets bored, lunch is ready because, honestly, nothing takes that long from start to finish. If something does require a lot of prep work (food processing, chopping, marinating, etc. ), I do this at night after dinner and before bedtime so all I have to do the next morning is put lunch in the oven or serve it. Heck, I'm sure most of these recipes would do just fine being made the night before and just reheated the day of serving. 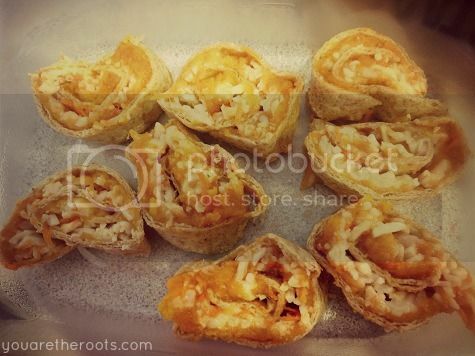 These veggie pizza roll-ups were a hit. The presentation is a little lackluster but that's because they were in the process of being packed up for a picnic at the park with Grandma. (Conclusion: they travel well!) These are fairly simple to make, much like a pizza. You'll need: a tortilla, shredded cheese, a carrot, butternut squash and tomato sauce. I had the butternut squash ready to go because I'd made it the night before as a side dish that Ethan didn't finish, so I packed it up and saved it for Monday's lunch. Just steam some butternut squash (a bunch of brands even make steam-in-the-bag butternut squash these days!) and mash it up with a fork, mixing in some tomato sauce until combined. 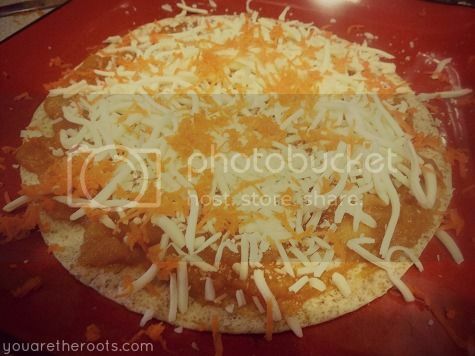 Spread the mixture onto a tortilla, top with shredded cheese and, using a hand grater, grate some organic carrot over the top. Pop the tortilla pizza in the microwave for about 30-40 seconds until the cheese is melty and bubbly. From there, roll the tortilla up and let it cool for a minute or two. Once cooled down a bit, slice the tortilla up and your roll-ups are ready to go. 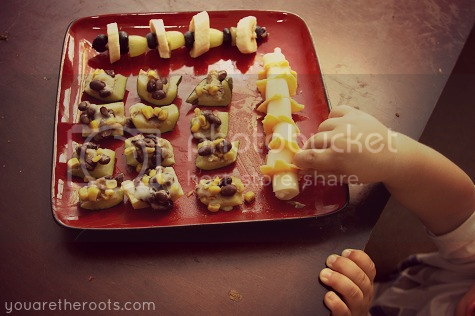 On Tuesday, Ethan had black bean zucchini and squash boats. I sliced a zucchini and a yellow squash lengthwise and stuck them in the countertop vegetable steamer for ten minutes. 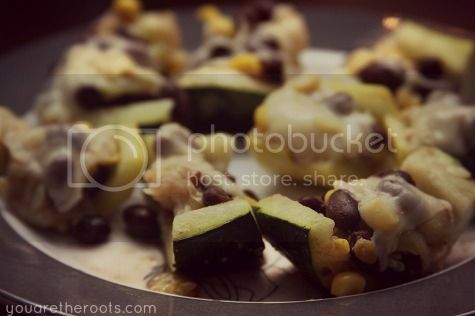 Once they were softened, I placed the zucchini and squash "guts" into a bowl and mixed in a drained and rinsed can of black beans and a half of a can of drained and rinsed corn. I seasoned the mixture with some black pepper and a couple of pinches of cumin. Once combined, I filled the zucchini and squash halves with the black bean mixture and baked these on a baking sheet for 25 minutes at 350 degrees. Once they were ready, I threw on a slice of provolone cheese and baked for another five minutes. 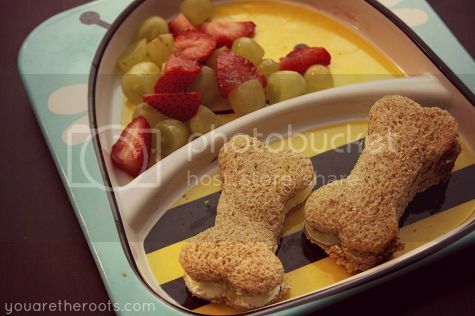 Ethan has been big into dogs lately so I couldn't pass up these cute dog bone shaped cookie cutters I found at Target. I used them to make him this avocado, cucumber and cream cheese sandwich for Wednesday's lunch. I spread some cream cheese on one slice of whole wheat bread and sliced up a cucumber into thin slices to place on top of the cream cheese. In a small bowl, I mashed up half of an avocado and spread it onto a second slice of whole wheat bread. This may be his new favorite sandwich! Breakfast can be fun for lunch, too! 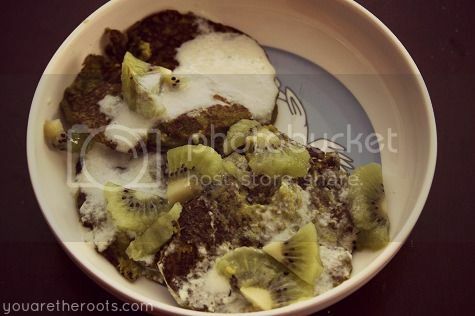 These veggie pancakes with cucumber yogurt 'syrup' were a huge hit. Ethan ended up asking for -- and finishing -- seconds. There are a lot of veggies packed into these pancakes: kale, spinach, sweet potato, carrot, zucchini and cauliflower. You can use any veggies you like or have on hand, I'm sure. I placed all of the vegetables in the food processor. I don't have any real measurements, it was just kind of whatever I had on hand: a handful of kale, 1/4 of the (baked) sweet potato, etc. You will need 1-1 1/2 cups of vegetable puree, though! Once smooth, I poured the puree into a bowl and added an egg, 1/4c all-purpose flour (I used King Arthur Flour's gluten-free blend), some black pepper and a pinch of garlic and onion powders. After spraying a pan (or skillet) with olive oil (or cooking spray) and heating it to medium heat, I poured the batter into the pan 1/4c at a time. They take about 3-4 minutes to cook per side. To make the "syrup," I threw some organic vanilla yogurt, some mint leaves and half of a cucumber into the food processor until combined. Ethan had insisted we buy a kiwi the last time we were at the store (I think because it was fuzzy and fun to play with) so I chopped it up to top this recipe with. He picked the kiwi off and threw it on the floor. Other than the pesky kiwi, he devoured these! Friday's lunch was mostly comprised of leftovers from Tuesday's zucchini and squash boats. I had tried to work on presentation a little. I had read an article on incorporating sensory activities into meal time as well by using strategic placement or presentation of the food. Ethan has preferred to have his snacks given to him "kabob style" after I packed our beach picnic dinner that way so I went with that for his sides this lunch. I paired the leftover zucchini boats with a kabob (I use paper cookie pop sticks so they're softer and not sharp on the ends) of organic cheeses and another with a variety of organic fruits: blueberries, grapes and banana. After Saturday's dance class, Ethan and I went to brunch with my parents and sister. (He had a slice of French toast, an egg and half of my mom's grits.) He wasn't really that hungry by lunch time and this smoothie from Jamba Juice was enough to fill him up. Ethan loves this smoothie. It's the second time he's ordered it and finished all sixteen ounces of it. I need to figure out how to make this at home. Any smoothie experts? 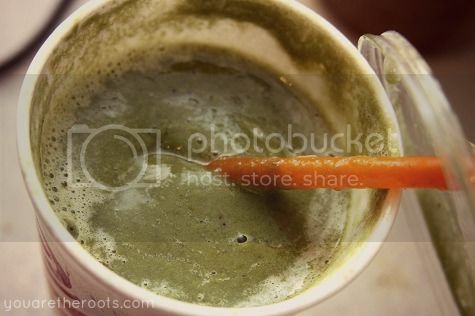 Here are the ingredients: Apple-Strawberry Juice, Green Vegetable Juice (Carrots, Spinach, Bell Pepper, Kale, Spirulina, Lettuce), Peaches, Mangos, Bananas, Ice. Let's see what I come up with next week. good job, girl! 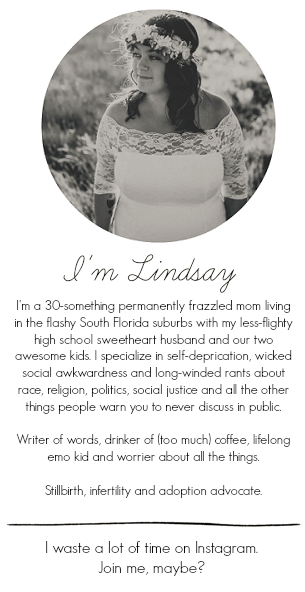 You are my inspiration...I will be coming to your blog for all lunch ideas from here on out. That pear/cheese sandwich combo sounds good enough for ME to eat for lunch so that will be on the menu today! I've been needing new ideas for packed lunches as well...that's probably the hardest for me...I hate always resorting to PB&J. The grilled pear/cheese sandwich is so yummy! Sometimes I totally make myself one, haha! I love your idea of making a note of on-the-go travel meals, so I'll definitely be doing that. I'm already in the process of trying to "revamp the boring sandwich" and experiment with some fun stuff. We'll see how I do next week! YAY! Our Publix had them BOGO this weekend, I hope you found the same luck! I can't wait to hear how you and the girls (and little Ephraim!) like them! ....I just had the best idea ever. 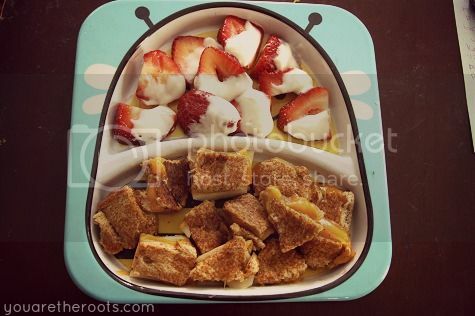 You should do a round up post of all your "play date" or "on the go" lunches. I would totally print it for my recipe binder as a reference! That's an awesome idea!!!!!!! When I meal plan Ethan's lunches for the upcoming week, I always plan certain meals that are able to transport for on-the-go lunches! I should definitely make note of those! I'll start that next week!!! Thank you! Ethan has THE LIFE! Grilled cheese with pears is one of my favorites. Does that make me a toddler? haha!